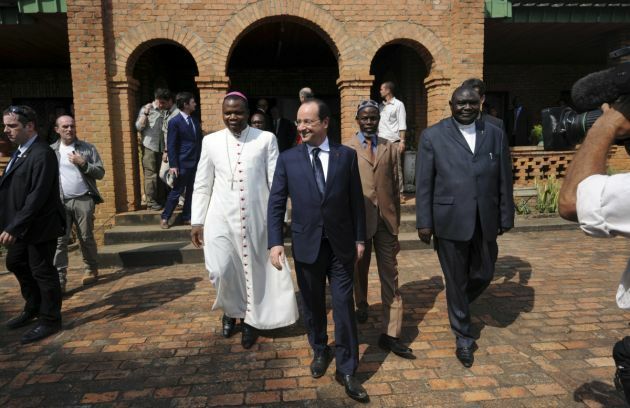 (Photo: REUTERS / Sia Kambou / Pool)French President Francois Hollande (2ndL) walks with the Archbishop of Bangui Dieudonne Nzapalainga (L), Nicolas Guerekoyame Bangou (R), president of the Alliance of Evangelical Churches of Central Africa, and Oumar Kobine Layama (2ndR), president of the Islamic community of Central Africa, in Bangui February 28, 2014. President Hollande flew to Central African Republic on Friday to tell its leaders and French forces stationed there that France will work to stop the country splitting in two. Picture taken February 28, 2014. The World Evangelical Alliance is deeply concerned about the large-scale human suffering in the Central African Republic but does not like the conflict being labelled religious. In CAR thousands have been killed in recent months, up to one million people are displaced and half of the population is in need of humanitarian assistance. The WEA said in a statement Friday it is also concerned that national and international media have incorrectly interpreted the root of the crisis in CAR as a religious conflict between Christians and Muslims, thereby fuelling religious tensions in the country. "The conflict in the CAR is not a religiously motivated conflict," stated Dr. Geoff Tunnicliffe, secretary general of the WEA. "The WEA is deeply troubled by the fact that some fighters now refer to their religion to justify their heinous crimes, dividing the country along religious lines." Muslims make up about 15 percent of CAR's population of around 5 million while Christians account for about 50 percent in the one-time French colony. Tunnicliffe said that the WEA supports and highlights the Bangui Declaration II produced on February 4 by church leaders representing more than 80 percent of the Central African population. This states that a military-political crisis has torn apart the social fabric of the country and has brought unimaginable pain, suffering, and sorrow to the people. Socio-political disorder led a number Central Africans to enter into armed rebellion against the State. "We do not accept the amalgam of labelling of anti-Balaka as 'Christian' militia. Indeed the anti-Balaka are the expression of exasperation, with the ongoing atrocities, from a part of the population – mainly young men – that witnessed multiple abuses by Seleka rebels. "However, we reiterate that all anti-Balaka are not Christians and all Christians are not anti-Balaka. It is the same for ex-Seleka and Muslims. Incorrect terminology that labels anti-Balaka 'Christian militias' must be corrected. This amalgam propagated by national and international media has given a religious connotation to a crisis that is in its core political and military,"
The WEA statement noted that its national member body, the Alliance of Evangelical Churches in CAR, along with representatives of the Roman Catholic Church and the Islamic Conference of CAR, have been working together to stem the violence, ease the tension, and to reconcile local communities. "We are encouraged by the bold position of the Church in the Central African Republic, clearly distancing itself from the fighting factions. "Rather than fuelling the conflict, religious leaders in the CAR call for restraint, peace, and reconciliation, leading by example," said Tunnicliffe, referring to examples of Muslims finding shelter in churches, public meetings involving both Christians and Muslims to convey messages of forgiveness and reconciliation, and other joint reconciliation initiatives.